Our home is directly on the beach. There are two buildings. The main building has a large open kitchen with a large island, a large family room both rooms have triple sliding glass doors that open to the beach. The master bedroom has a queen size bed, a double sliding window to the beach and a double sliding door to a private garden. It also has it's own bathroom. Upstairs there is a large terrance and a room (with private balcony overlooking the beach), double bed and a private bathroom. The second building (affectionately called the "surf shack") Has a bedroom upstairs with two bunk beds (can be converted to one double bed) and a private balcony overlooking the beach. There is a bathroom downstairs. My wife decided to leave the hustle and bustle of the San Francisco Bay Area and pursue a simpler life with our three children. We found it here. 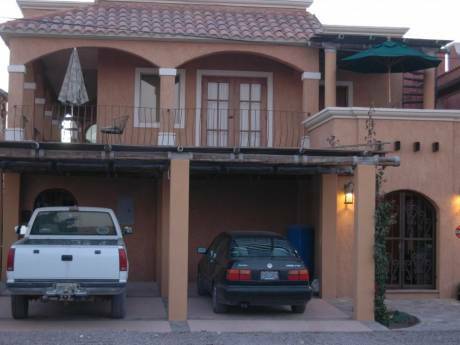 Our home is located between Cabo San Lucas and Todos Santos. We are 45 min. from the night life of Cabo and 10 min. From the art galleries and traditional Mexican small town of Todos Santos. We overlook the San Predrito Surf Break. The break is a heavy right point in the winter and a fun beach break in the summer. Watch the whales migrate from November until March. You'll have a front row seat to some of the most beautiful sunsets in the world. This is beach country living. Dirt roads and and Mexican beer. You can be as sucluded as you want to be!! !